Considering throwing a party, it takes planning; you should start planning at least two weeks ahead for parties up to ten people. If you are having a cocktail party or an open house party that the number of guests could reach into the hundreds of people, start planning at least two months ahead. The first step in preparing for your party is the date and time, for cocktail parties a good time is about two hours before dinner. An open house party is usually held from one to four pm or from three to six pm. The next step is to determine approximately how many and who will be attending the party. At this point if there will be more than twenty people attending you may wish to enlist the help of family or friends. There is another option of hiring extra help; just to help serve or you may consider offering a valet service. You will need to send out invitation at least a month in advance and request that they notify you if they will be attending. This will give you an exact amount of guest that you will need to supply food and drinks for. If the party going to be an informal affair Of ten or less people then you may consider a dinner setting for food. If you will be entertaining more than ten people, a buffet will be in order. You may consider contacting a caterer for this service. When considering drinks, you know your guests and what they like to drink. You must determine if the guest would prefer non-alcoholic or alcoholic beverages It is best to have both to serve the taste of your entire guest. Remember when buying foods and drinks, there are many retailers that will give discounts when products are bought in volume. In a medium glass or stainless-steel bowl, combine the tamari, Worcestershire , molasses, oil, lime juice, ginger, 1 on of the sugar, the red-pepper flakes alt. Add the chicken and toss to coat and marinate in the refrigerator for l hour. 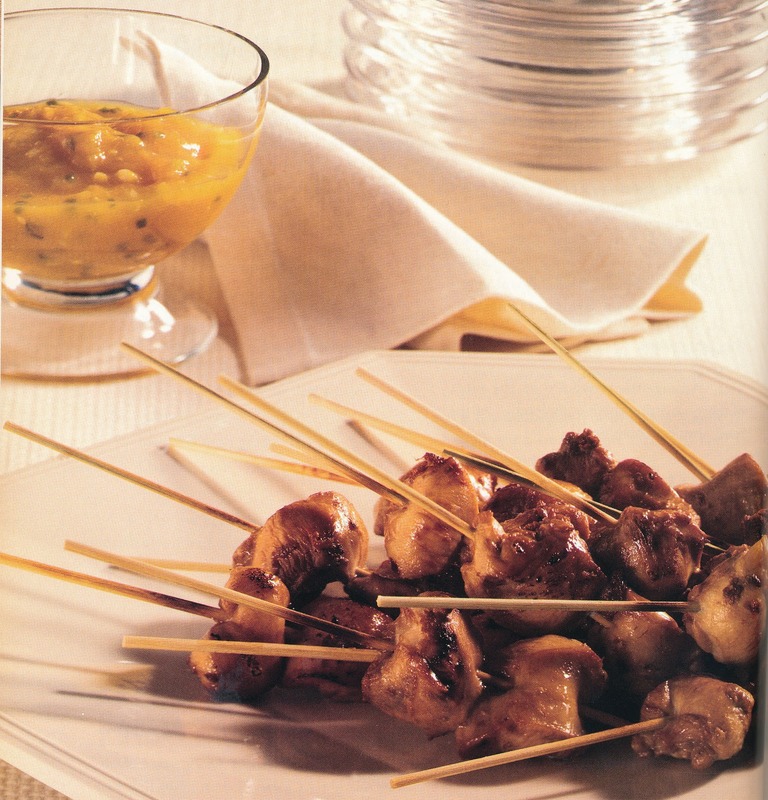 In a shallow dish, soak 24 six-inch wooden skewers in water for at least 30 minutes. In a medium stainless-steel saucepan, combine the mango, garlic, jalapeno, the remaining 3 teaspoons sugar and the vinegar and bring to a simmer over moderately low heat. Cook, stirring occasionally, until the mango is soft, about 15 minutes. Transfer to a food processor or blender and pulse or blend briefly to a coarse puree. Let cool. Heat the broiler. Drain the chicken and thread 2 pieces onto each skewer. Put the skewers on a baking sheet and broil, turning once, until golden brown on both sides, about 5 minutes in all.